Vegetables and fruits are full of nutrients that may help promote good health. Choose red, orange and dark green vegetables such as tomatoes, sweet potatoes and broccoli. 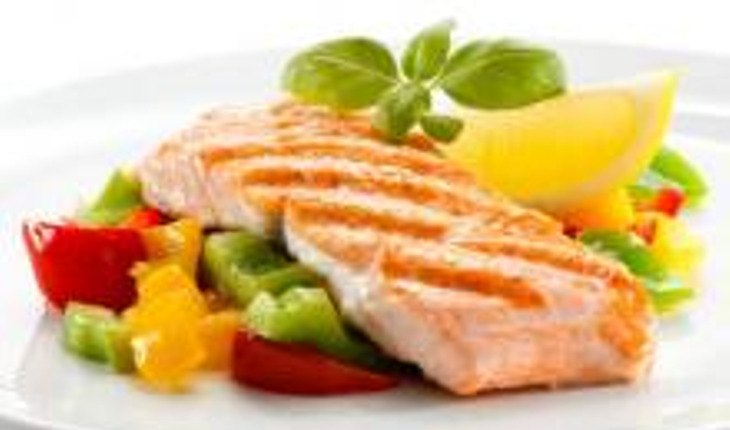 Choose foods such as lean beef and pork, chicken, turkey, beans or tofu. Twice a week, make seafood the protein on your plate. Aim to make at least half your grains whole grains. Look for the words “100% whole grain” or “100% whole wheat” on the food label. Whole grains provide more nutrients, like fiber, than refined grains. Using heavy gravies or sauces will add fat and calories to otherwise healthy choices. For example, steamed broccoli is great, but avoid topping it with cheese sauce. Try other options, like a sprinkling of low-fat parmesan cheese or a squeeze of lemon. Savor your food. Eat slowly, enjoy the taste and textures, and pay attention to how you feel. Be mindful. Eating very quickly may cause you to eat too much. This will help with portion control. That way you can finish your entire plate and feel satisfied without overeating. Eat at home more often so you know exactly what you are eating. If you eat out, check and compare the nutrition information. Choose healthier options such as baked instead of fried. Keep it interesting by picking out new foods you’ve never tried before, like mango, lentils, or kale. You may find a new favorite! Trade fun and tasty recipes with friends or find them online. Indulge in a naturally sweet dessert dish—fruit! Serve a fresh fruit cocktail or a fruit parfait made with yogurt. For a hot dessert, bake apples and top with cinnamon. For more information on nutrition, visit www.choosemyplate.gov.